Discover the scenic charm of Belgium and the Netherlands with this 8-day roundtrip from Amsterdam. Visiting Veere, Antwerp, Arnhem and Hoorn, this is the ideal way to explore this serene corner of Europe. The Netherlands and Belgium boast some of the most picturesque landscapes in northern Europe, where medieval windmills dot the countryside and patchwork flower-fields stretch to the horizon. 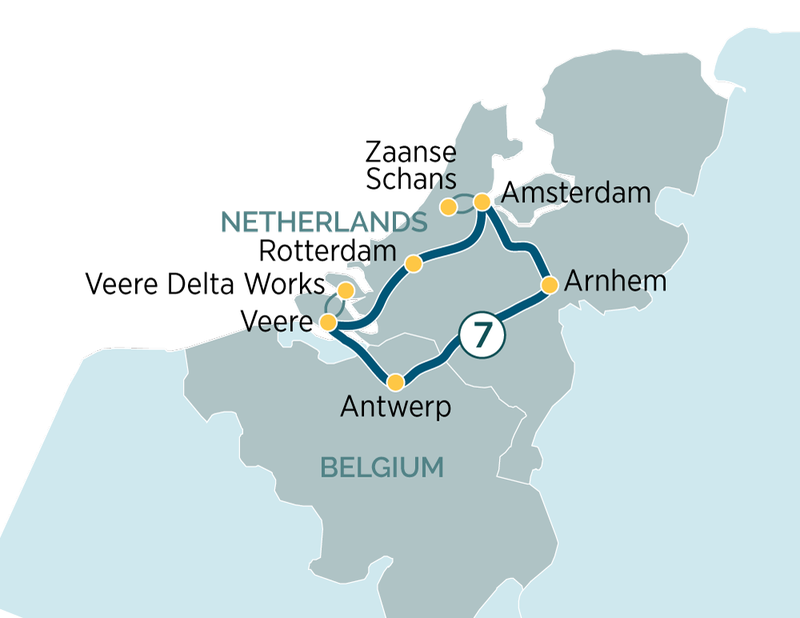 It’s here, among the canals, waterworks and rivers, where you’ll enjoy this wonderful 8-day itinerary, which takes you from the elegance of Amsterdam to the delightful Flemish countryside via charming destinations like Arnhem, Antwerp, Veere and Hoorn. Departing from Amsterdam, you’ll pay a visit to Zaanse Schans, a vibrant community founded in the 18th century, before travelling to the coastal town of Veere. Here, you’ll be introduced to the fascinating Delta Works, which were built in the 1950s to prevent the area being ravaged by the North Sea. From there, you’ll travel into Belgium via the River Sheltz to explore the charming medieval streets of Antwerp, Belgium’s illustrious second city. Before returning to the Dutch capital, you’ll visit Arnhem, a charming village which was the scene of one of the most significant battles of WWII. After calling at Hoorn, once one of the most prosperous trading towns in the Netherlands, you’ll head back to Amsterdam, where you’ll be given the chance to visit the incredible Keukenhof Gardens. Return economy flights from one of up to 15 UK regional airports are included in the price of your holiday. Please call us to check if we can offer your local airport. If you’d prefer not to fly, return travel via Eurostar is available. Welcome to Amsterdam, a fascinating 700-year-old city of picturesque canals, world-class museums, theatres and cafés. Here, you will be met and transferred from the airport to your Emerald Waterways luxury Star-Ship. After boarding, enjoy some time at your leisure to explore Amsterdam. This evening, join your fellow travellers for dinner on-board. After breakfast, it is time to say farewell to your fellow passengers and disembark the ship for your transfer to the airport. Your flight home is included in the price of your holiday. Please call us to check if we can offer your preferred airport. If you’d prefer not to fly, return travel via Eurostar is available.